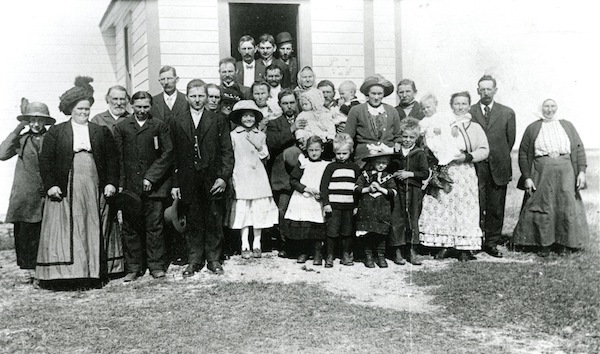 Hardy Latvian pioneers at the Fairville School north of Dauphin in the early 20th century where they held social functions and religious services. Photo credit: Ojārs Kļaviņš (deceased). What started out as an article on the history of Latvians in Canada’s Manitoba province is now morphing into a book as more and more material gets uncovered. Why Manitoba? Before World War I, Manitoba had the largest concentration of Latvians, or the Lettish as they were called back then, in Canada. It was home of perhaps up to 1,000 Latvians living in three areas of the province. The first Latvian in Manitoba was Jānis Ālers (John Aller) who settled near Sifton north of Dauphin. He arrived there in 1895 via the United States after spending five years in South Dakota. He invited friends and relatives from the Bauska area to join him. Land was cheap and the climate was similar to Latvia’s. And $10 bought you 160 acres, as long as you cleared a quarter of it and put up a dwelling within three years. Nineteen families followed over the next 10-15 years. They settled around Sifton, Fork River, Fishing River and Oak Brae. For the most part, the arrivals were peasants who were pursuing the dream shared by many Latvians of that time, namely to own a piece of land that they could farm. Other Latvians homesteaded northeast of Winnipeg in Libau, Lac Du Bonnet, further east in Lettonia, Lee River and still further east in Bird River where the Prairie gives way to the boreal forest of the Canadian Shield near the Ontario border. Among the Bird River settlers were a number of families who had arrived via Brazil which they abandoned because of the heat and tropical diseases. The area east of Lac Du Bonnet was also home to Latvians who fled Czarist retributions following the 1905 Revolution when workers and peasants inspired by Marxist teachings rose up against the hated Russian factory owners and Baltic German landowners who ruled most of the countryside. They made their way to Manitoba through the United States. Some were committed Marxists or Socialists, others were caught up in the events of the time, while still others fled to avoid conscription. There is documented evidence that the “politicals” continued to meet in Manitoba well into the 20th century holding lectures and discussion evenings in some cases with visiting speakers. Some gravitated to the nascent Canadian Communist party while others joined the socialist and labour movement on the Canadian Prairies. Many became disenchanted by what they saw in Stalinist Soviet Union. Still others abandoned their youthful zeal and farmed or became entrepreneurs. Then there were those who preferred cities and settled in Winnipeg. In 1912 Jānis Šmits founded the Lettish Friendly Association of Winnipeg and in 1913-14 published Kanadeetis, the first Latvian newspaper in Canada. It was written in old Latvian orthography using Gothic script. When Latvia gained independence, Šmits and his family moved back to Latvia only to be deported by the Soviets in 1941 and then perish. The Latvian pioneers maintained their traditions. There were community events. Christmas and Easter were celebrated the Latvian way. So was Midsummer Night’s Eve or Jāņi. There were dances to phonograph records sent from Latvia. Local musicians played. They read Latvian books and newspapers. Some even visited Latvia or had relatives come over for visits. Once or twice a year visiting Latvian, Estonian or German Lutheran pastors held services and christenings. The first generation born in Canada typically spoke Latvian at home with their parents and in some cases grandparents who had also come along. There were rural schools where 75% of the students were Latvian. Teachers ordered the children who only knew Latvian to speak English. Community halls were built in Lettonia and Lee River. The one in Lee River is still standing today. Businesses were formed and some still exist – Lindenberg Seeds in Brandon and Osis Lumber in Lac Du Bonnet. Over time assimilation took its toll. Many of those born in Canada or in turn their children married locals. Many moved away to cities looking for jobs. However the early pioneers were still there to “greet” the Post World War II refugees who had fled the Soviet occupation of Latvia. They came from European Displaced Persons camps to Manitoba as contract farm workers, lumberjacks, construction and hospital workers or domestics. They were free to go after two years and many then headed for cities like Winnipeg. The Post War Winnipeg Latvian community was born. For the most part, the earlier pioneers and their descendants, got along well with the new arrivals. There were intermarriages and some bought properties or farms in the original colonies. Throughout the 1950s, Latvian pastors from the newly founded community headed out to the countryside to hold services. Local Latvian theatre troupes from Winnipeg also entertained those in the pioneer communities. The two groups often celebrated Jāņi together. But as the original settlers grew old, the pioneer communities petered out by the late 1950s. Meanwhile throughout the 50s, 60s and 70s, there was a thriving Post War Winnipeg Latvian community. Perhaps numbering up to 500 at its peak, there were two Lutheran congregations, the Winnipeg Latvian Society, the Daugavas Vanagi veteran’s organization, a university student alumni organization, a youth group, a Sunday School and many functions ranging from formal commemorations on November 18 when Latvia celebrated its independence to dances and outings. For decades, the Society published Informators, a monthly news bulletin. Among its subscribers were the pioneers and their children or at least those who could still read Latvian. The Post War Winnipeg community went into decline in the 1980s. The earlier refugees were ageing. Their Baby Boomer children had gone to university, started careers, intermarried, were raising families or moved away from Manitoba looking for better jobs. Manitoba was also isolated and far from the larger and still thriving Latvian communities in Canada and the United States. The community stalwarts who had run things since day one held the fort but by 2007 everything in Winnipeg had been shut down. This September it was time for me to head out west to Manitoba and to supplement my research by seeing the pioneer colonies with my own eyes and meeting contacts that I had established by phone or email. Over the course of 6 days, I covered 1,400 km or 870 miles. I met with several dozen people, most of them descendants of the early pioneers but some post-war arrivals and their children. Several joined me as we visited buildings on pioneer homesteads still standing although in disrepair, as well as cemeteries where Latvians lie. We stopped in Libau and Lettonia, two of the Latvian place names in Manitoba. On the trip east of Lac Du Bonnet, I was joined by local historians. In Swan River about 6 hours northwest of Winnipeg I met Aina (Gulbis) Turton. Originally from the other side of Manitoba, her family was one of those who arrived from Brazil around 1910. Aina was born in 1926 and grew up in Bird River. Several years ago she authored a delightful book of personal memories called The House Beside the Rock Hill – A story of pioneer life in a Latvian settlement. Although few descendants of the early pioneers could still speak Latvian (but none had problems pronouncing Latvian names), I was pleasantly surprised that most were cognizant and proud of their Latvian roots. I was shown recently-printed books on Latvia and its history. There are readers of Latvians Online in rural Manitoba. Some have visited Latvia. Some have been down East to attend Latvian Song Festivals. Others have shopped for Latvian goods online or stopped by the Latvian Centre in Toronto. There were Latvian hockey jerseys and t-shirts. Some had immersed themselves in family histories, digging through archives and tracing their roots back to Latvia. One of the projects that a couple of us decided to see if we could make happen is getting the province to set up several official historical markers attesting to the Latvian footprint in Manitoba. This year, the Lac Du Bonnet Historical Society is planning a Latvian-themed annual wine & cheese reception. While their numbers are not huge, the descendants of the Latvian pioneers in Manitoba represent a constituency to which the Latvian community in Canada has given little thought. Manitoba is perhaps unique in that there are few places where the pioneers or veclatvieši as they are called in Latvian, settled in numbers. Alberta is the only other place in Canada and the numbers were smaller and the communities dissipated sooner. There is Wisconsin in the United States and the Boston, New York and Philadelphia Latvian communities trace their roots back to the late 19th century. The story of Latvian pioneers is a fascinating one and my project continues as I try to digest and work new information, stories, photographs and artefacts into my manuscript. It is also an important story for the Latvian community abroad to ponder as the ranks of the veclatvieši are swelled by descendants of the post-war Displaced Persons as they get assimilated into the fabric of Canada and the United States. The dates their parents or grandparents arrived may be different, the stories of their predecessors may be different, but they represent a similar constituency with connections to Latvia and the Latvian heritage that cannot be ignored. 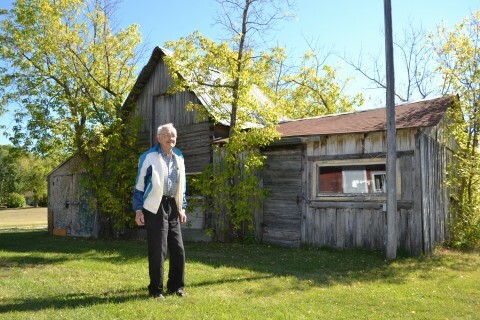 93 year old Arnold shows his family’s homestead near Lettonia. His parents arrived from Latvia in 1910. Photo: Viesturs Zariņš. My English husband and I currently live in Stelpe, Latvia. It is a blessing to learn of this project to trace the movement of Latvian people. The world needs to hear of the courage and determination of the people of Latvia. Hello, I did read about your grandpearents. The Dancyt is not known as Latvian surname, but Arro is known Estonian surname. Still 1918 the half of Estonia and northern part of Latvia were one region in Russian empire. Maybe you can find your grandfather if you are looking for Arro family roots…? Great article. Your description of the Latvians who fled following the 1905 Revolution made me recall stories my father used to tell me. He told me his family fled for their lives escaping first to Germany and then by ship to New York. The promise of land in Manitoba lured them to the Lac Du Bonnet area. My grandparents are buried in the Lettonia cemetary – although I have never been there. I appreciate this insight into my family history. I have submitted a reply, in regards to comment you had about your great-grandfather, Alexander Lindenberg, who settled in Libau, Manitoba. There is a “your comment is awaiting moderation”,… above my reply, so I do not know if it will be posted or not. Hopefully it will. Good morning Leesa! This is my second attempt to reach out to you through this forum. I am hoping you are able to receive this information. My maiden name is Lindenberg. My mom believes she knew your great-grandfather Alex. He would have been my grandfather’s brother. My mom said she remembers him being a “shoemaker” in Selkirk, Manitoba. If your grandparents’ names were Margaret & Jack, then I have a family tree to share with you if you wish to contact me. Alexander was my great-uncle and my mother often talked about going to visit him in Selkirk. He was well liked and respected in the community. I am just seeing this today. You can email me at ljwalk@mts.net if you’d like. Thanks for your reply. interesants raksts, paldies :) pēdējā laikā arvien vairāk sāk patikt palasīt “random” veco pasaules latviešu dzīves stāstu izgriezumus. I am also a descendant from the Lac DU Bonnet settlement. I know many Latvians in the area, and all are proud of being of Latvian descent. My great grandfather settled in Lac DU Bonnet area in about 1918. I am thankful he escaped Latvia as a young man, as I may not exist had he not. When I grew up all the Latvians seemed to get along. We would gather often on Saturday nights at the Lee River Hall, where we would learn to dance and socialize. I have many fond memories of these days. My Great Grand father’s name was Alfred Kronberg, but I also realize original name may have been changed or altered. Hi Lisa, I’ve been remiss following the posts to my own article. I believe we me at my Lac Du Bonnet presentation in 2015 but I neglected to get your contact information. Any chance you’d be willing to give me a shout about your family’s story? OBTW – Alfred Kronberg would be spelt Alfreds Kronbergs in modern Latvian so it was pretty close. You can reach me at starkis@sympatico.ca. It would be great if you could. I just talked to my mom to confirm. My grandfather had a brother they called Uncle Alex. My maiden name is Lindenberg. I have carried it as one of my middle names, since I got married over 30 years ago. I am very proud of my Latvian heritage. I would love to share any family history I have with you. Please email me if you wish. Greetings, on the occasion of the Baltic countries commemorating their 100th anniversary of independence a tree will be planted this spring in the Baltic Circle in Winnipeg’s Assiniboine Park. Looking for some Latvians to attend this event. email me gilesbugailiskis@hotmail.com. My maternal grandfather was Latvian, part of the Boston, MA Lettish community. His siblings settled in different areas including Canada. It is a long shot, but I am searching for one of his sisters, she may have lived in the Lac du Bonnet community. Her maiden name was Erna (Ernastina) Alise Dosenberg (born Sept 1893, in Latvia). I do not know her married name but believe her husband may have been in the printing business. Any clues would be appreciated.